The problem of living in CA is that all those great trails you guys ride (Katy, Paul Bunyon, GAP etc.) will require a plane ride for me. So I'm seriously considering getting a breakaway touring frameset to save on airline fees (I fly United which is $150 each way). So has anyone tried one and can comment. 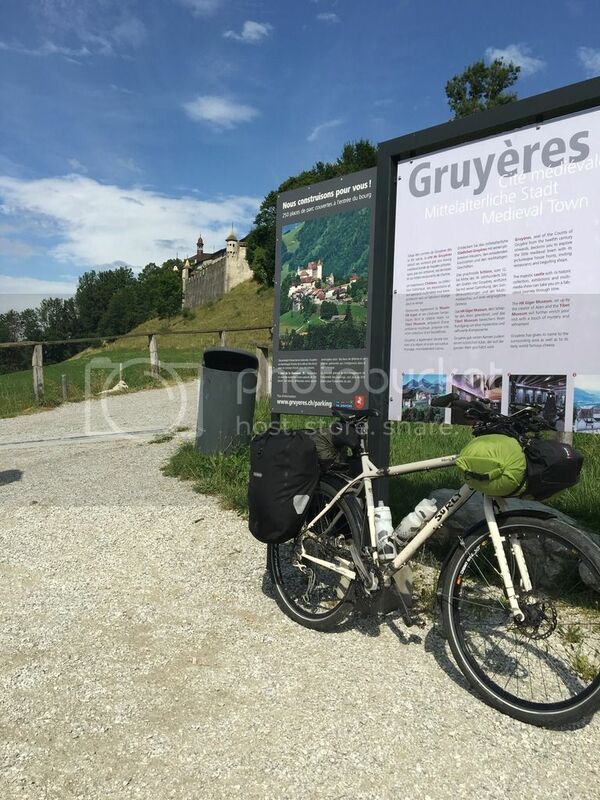 I took my Surly World Troller to Switzerland this summer. It was nice having my bike set up just the way I like. It's a bit of extra work to disassemble and reassemble the bike. And costs a bit more than a noncoupled bike. I Own a Bike Friday Travel Bike .. It packs even smaller because it drops the big wheels and designs around 20" wheels instead. They fit in a suitcase. I have spoken to a fellow who the airline employee asked to see whats inside the S&S case , refusal meant going no further..
and seeing it's a Bike charged him the Fee anyway. Surly AFAIK no longer makes an S&S Trucker & Ritchey's page doesn't include the Tourer. Couplers can save a lot of money in air/taxi fees but they're a lot of work, generally at least 1 hr each for disassembly/reassembly. Unless Ritchey has significantly redesigned the Breakaway, their case actually exceeds the airlines' 62" L+W+H limit for "standard luggage". That said, friends who own Breakaways have traveled with them and not been charged for oversized luggage. It all comes down to the check-in agent and how strict or relaxed they're feeling at the moment you approach them. I have both an S&S BTC road bike and a Bike Friday with ETRTO 451 wheels (the largest of the mutually incompatible '20 inch' wheel sizes). The S&S case is right at the 62" limit and feels unwieldy. The BF fits into a regular Samsonite and performs well enough to use in centuries, cyclosportives and granfondos. Just reply that it is a "custom mobility appliance". The problem of living in CA is that all those great trails you guys ride (Katy, Paul Bunyon, GAP etc.) will require a plane ride for me..
plane ride for you maybe. bus or train or freight for mr. bicycle. I was out riding last weekend, and met someone on a small wheeled touring bike. Real nice setup with waterproof bags. Low on front. In hindsight, I wish I had gotten a photo. It may have been a Rodriguez 6-pack. No doubt the whole rig cost a fortune. Even without the couplers, the weight distribution on the bike looked great, and if built right, it may well outperform similar bikes with a higher center of gravity. I have a coupled and have to ask how often for plan to fly with it because people are right that taking it apart and putting it together to work. When you add in the crowd that shows up to watch it is stressful at time. As for flying if they see a helmet they will try to get the fee regardless of the size of the case. Do the breakaway or S&S coupled bikes have any handling issues when loaded? Are the load weights restricted? I'm guessing there is some cost associated with not having a contiguous solid frame or am I wrong? I've been looking into these as well, and while I haven't ridden one, everything I'm seeing says that the coupled bikes are stronger/stiffer than the uncoupled versions. Hopefully someone who owns one will weigh in on this. I also did a quick google check on bike fees, and apparently United will consider a bike a checked bag if it meets the size/weight requirements, which the S&S case should. Of course with the airlines, fees seem to subject to change at a moments notice. Now that's a counter-intuitive observation but the more I think about the more it makes sense. Getting to ride one of these things is going to be a challenge. I've put in a call to Surly to ask for someone to call me back about the trucker deluxe frameset. lengths that make any frame stiffer or flexible. limiting factor the wheels , cannot make the case smaller than the wheels. Last edited by fietsbob; 09-20-16 at 08:08 AM. Purpose-built S&S coupled bikes have no additional restriction beyond the original frame specs. I currently have a factory-coupled Gunnar Sport for light touring (does 4 full panniers count as light? ), and used to have a Surly Travelers Check (same as Cross Check, but with couplers installled at the factory). I don't think twice about using those bikes for touring or gravel riding or fast group rides or whatver. They're solid bikes. The couplers are completely forgotten while riding the bike. If I bought a new coupled bike, it would have 26" or 650b wheels to make packing easier. I have to pull off my 700x32 tires to fit my 56cm bike in the case. On my wife's 46cm Travelers Check with 700x25mm tires, I can leave the tires mounted, but deflated, to fit in the case. None of our travel bikes have disc brakes, but if they did, centerlock rotors would be the choice. Bikes: Road, mountain and track bikes and tandems. The S&S coupled bikes do not have any handling issues when all loaded up and there are no weight restrictions. Ther is also the patented Ravello dismountable system which also has no handling issues or weight limit and does have a cleaner look without those large silver humps on the frame. The cost for the Ravello retrofit on an existing frame is almost half of an S$S. From CA, check out the option of riding Amtrak. Bikes are much cheaper on Amtrak than on airlines. I have taken an uncoupled bike on three round trip tours and one one-way tour on Amtrak. But Amtrak can be much slower and on routes that only run once a day you might find the train goes through the station at 3am, so it is not always a convenient option. I arrived at 1:15am, 3:30am and at 4:30 am on some of my Amtrak bike travels. But on Amtrak when using the bike box (buy the box from Amtrak at the station), the wheels stay on the bike, it is reasonably quick to pack and unpack because the bike remains largely assembled. My expedition bike is a Thorn Nomad with S&S. The S&S couplers as an option on that frame cost roughly $550 more. And I paid about $225 for the S&S Backpack case. Throw in a few extras and you are close to $800 for extra costs. I saved $300 round trip in airline fees on my last tour by being able to use a S&S coupled bike. I also could take a taxi (and it was a Prius) to the airport, most taxis in my area can't carry a bike box. So that make getting to the airport and home again later much easier, I did not need to impose on a friend with a truck or minivan to take me both ways. I budget 2 to 3 hours to disassemble the bike for packing, but that will likely go down with practice. And about 1.5 hours to reassemble after arrival. My frame (59 cm) is a tight fit. It is big enough that I have to remove both crank arms to pack it, remove the fork from the frame, etc. Even the water bottle cages have to come off. And my rear rack (Tubus Logo) does not fit in the same case as the bike, my second checked bag has to carry that rack. So, my second checked bag had to be of a size and shape that would hold the rack, along with my camping gear. I built up my bike from the frame, laced and trued my own wheels, etc. So packing and reassembly is not a problem for me, just time consuming. I did have to tweak a few spokes after reassembly, the wheels were no longer perfectly true. I suspect that other stuff was packed on top of my case at the airport, thus the wheel truing. First photo is the stuff that went to the airport, two checked bags, one carry one (yellow duffel), one "personal item" (handlebar bag) and my helmet (wore onto the plane). Second photo was when I had most of my stuff packed into the case, but not quite all packed yet. Someone had a good thread on his new Surly S&S bike a few months ago on this forum, look for it. You will also have to find a place to store your case while you are touring. Last edited by Tourist in MSN; 09-20-16 at 08:47 AM. Look at that Thorn Nomad and how well it fits into the case. 26" has its perks. I use the same backpack case with my 58cm 700c tourer. Not only is the bike larger than average, but it's a touring bike so the fork steerer is extra long. Once upon a time I used to pack the bike with the tires on the rim; bottle cages, brakes, and crankset on the frame; but jigsawing all that into the case took 45 minutes every time and everything was so weaved together that I was worrying about my wheels not staying true. These days I take the pedals, crankset, bottle cages, tires, and brakes off before packing the bike. I have dynamo lights so the rear light cable has to come off the frame, and the front light dangles between the fork legs in the case. The fenders stack around the rims. The tires get folded and shoved somewhere. The saddle and front rack all fit in the case. The rear rack has to be packed separate. I use a 100L mountaineering duffle to hold three panniers, the rack, and my helmet. I take my fourth pannier and handlebar bag as carry-ons. The bike bag weighs 16kg. The duffle weighs 18-21kg depending on touring load out. The international weight limit is two pieces of max 20kg each. The counter clerks don't bother you if you're a couple of kg over. Let me summarize: it's not just a bit of extra work to pack one of these bikes. Unless you ride a frame size below 54cm it's like you're building a new frame every time. You will need to tour with the coupling spanner and possibly a crank/bottom bracket tool. If you are going on a week long tour, you are going through the process four times in the same week! What usually ends up happening is that by the time I get back from my tour, I'm so drained from working on the bike that I leave it in the case for weeks and just ride one of my other bikes. Eventually I put it back together because I need it for hauling something, as none of my other bikes have racks. I live in China and the airlines here don't charge for bikes. Unless I'm flying international I just use a full sized bike bag. I've flown enough international with the bike that I've made my money back, but it's taken years. The couplings add a small amount of weight to the frame. Once tightened to spec they are as strong as the tubes and do not affect the handling in any way whatsoever. Last edited by Yan; 09-20-16 at 10:23 AM. To Put your stuff into ..
Last edited by fietsbob; 09-20-16 at 10:46 AM. The bike bag weighs 16kg. The duffle weighs 18-21kg depending on touring load out. The international weight limit is two pieces of max 20kg each. The counter clerks don't bother you if you're a couple of kg over. I did not want to deal with taillight wiring, thus use battery powered taillights. I have a AA charger that is powered by USB charger, so with some AAA to AA adapters I can charge the taillight batteries from the dynohub. I also have some quick connect electrical spade fittings at the fork crown so I can unplug my headlamp and USB charger from the dynohub wiring that is zip tied to the fork blade. The yellow wires that are zip tied to my fork blade plug into the black wires on the headlamp in the attached photo. You made a very good point on weight, a small portable luggage scale to use when packing can be a big money saver if you only have to use it once. On my last trip my two bags weighed 48.5 pounds when I got to the airport, the airline scale said 49 pounds, Delta has a 50 pound limit. On my return trip I was just barely underweight again, thanks to the scale. If you do not mind using a two wheel trailer that is 20 some inches wide on roads that have virtually no shoulder, or worse yet has rumble strips near the edge, then the trailer will work for you. I mentioned above that I did a tour where three people brought Bike Fridays, two used the trailers and even with that disadvantage they were happy with the trailer option. The third used rack and panniers. How long does disassembly/packing/reassembly take with a normal bike for others? After having done it a couple times, I could probably break an hour per bike now (less for reassembly), but I don't see significantly improving the disassemble/pack side of things. If most of your tours will be stateside, it's far easier to just ship your bike. Then you don't have to deal with dragging a big box through the airport. I've used bikeflights.com a few times to arrange shipping via FedEx. Last time I paid about $50 to ship the bike. Much cheaper than the airlines. But I also have a bike with couplers. It takes some work to pack it all in and to reassemble. Truthfully, I'm not sure it's worth the expense. Ravello system sounds pretty nice; Brian Myers also builds aluminum coupled bikes, steel coupled bikes, custom etc, prices seem reasonable. A lighter frame is helpful for travel bikes incl meeting airline weight limit with hard case. Folks focus on the assembly time but consider how couplers save time/money in other ways: no calling/hunting for bike boxes, no need to get a ride/taxi to & from airport/train station etc. With a cardboard bike box one can quickly assemble & ride away but airports (even in Europe) don't always have safe bike roads. With the S&S backpack case it's fairly easy to use public transport. Some "pros" even assemble their coupled bikes at the airport. Soft-side backpack case is light enough to lash to rear rack for the ride to hotel etc. Of course one needs a place to store the case but they are fairly small. First-time packing is a hassle but just take detailed notes. S&S assembly improved my mechanical ability on components I wasn't previously familiar with. Disassembly/assembly can be done at home/hotel where one can relax more & not mind the time so much. Some folks like coupled bikes just for ease of car transport: just unhook the couplers & remove wheels (<5 minutes) so bike fits easily into a small car. I figure that if one is really interested in touring & is spending good money, why not get the coupler option? If one keeps bike as sole tourer for 10 or 20 years it's gonna pay off. Also a coupler retrofit is a nice excuse to get a custom powder coat. Production tourers are usually in mousy colors; Bilenky's powder-coating friends made my bike gorgeous & the finish is amazingly durable. If you do get S & S couplers, make sure you get a new paint job. I just spray painted the one inch area, and eventually water got in the tube and siezed the bottom bracket. Bilenky said the frame was unsafe and trashed it. I would not do it again. The case, the couplings and the paint job cost a lot of money. I had to pay $75 to fly with Delta. They charge if it is a bicycle, not by size. I did get my money worth before the steel frame rusted, but I would get a Bike Friday next time. I am retired so I drive to cycling events. I have not crossed the big pond with a bicycle. If you do get S & S couplers, make sure you get a new paint job. I just spray painted the one inch area, and eventually water got in the tube and siezed the bottom bracket. Bilenky said the frame was unsafe and trashed it. I would not do it again. The case, the couplings and the paint job cost a lot of money. I had to pay $75 to fly with Delta. They charge if it is a bicycle, not by size. I'm not sure what the paint had to do with water getting into your frame? It's possible the water seeped in through the coupler interface (teeth/nut), but unlikely through the junction of the coupler and the frame tube, as that is brazed. It's a good idea to treat any steel frame with FrameSaver, especially S&S-coupled bikes. That said, I have quite a few steel S&S-coupled bikes, and have never noticed problems with water getting inside. My oldest bike with couplers is an S&S Santana tandem from 2000, and it's still fine despite plenty of rides in the rain.